Much of the uncertainty in the short and medium run deficit is related to the business cycle. 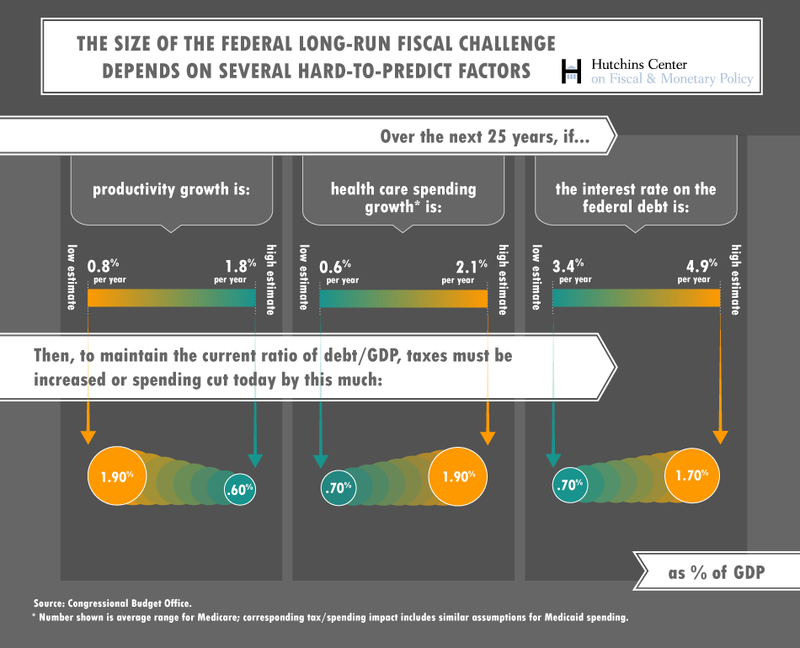 For the long run, the main sources of budget uncertainty over the next 25 years are the rate of productivity growth, the interest rate on the federal debt, and the rate of excess health cost growth. Whether these factors move in a favorable or unfavorable direction will determine the nature and extent of the fiscal response needed for stabilizing the national debt as a share of GDP. A possibly unfavorable outcome should weigh more heavily in future planning than should the opportunity cost of saving now if outcomes turn out to be better than expected. The United States should actively respond to this uncertainty by increasing its rate of saving, either through a reduction in spending, an increase in taxes, a reduction in the size of implicit government liabilities, or some combination of these actions. A precautionary savings buffer would allow for longer-term planning, more flexibility to meet economic shocks, and would reduce the need to increase marginal tax rates in the face of budget pressures. More effectively conveying uncertainty, perhaps by requiring the Congressional Budget Office to include a quantitative assessment of the degree of uncertainty present in its forecasts, would be a step in the right direction towards addressing the uncertainty involved with fiscal policymaking. Another policy option would be to subject the government budget to some sort of a “stress test,” in order to determine the government’s ability to meet its needs if unfavorable conditions arise. Finally, if automatic adjustments were used to provide budget stability and ensure appropriate risk-sharing across generations, it would reduce the need for Congress to continually make changes to legislation in response to changes in circumstances. Basing policy on forecasts longer than that [the next decade] is kind of a crazy thing to do. If you take the confidence interval around the deficit forecast, not 20 years out, not a 95% confidence interval, but 5 years out, a 90% confidence interval. That confidence interval is 10% of GDP-wide. It is plus or minus 5%. If, with global climate change, people were telling us temperature change would be between -3° to + 6°, we wouldn’t be acting on the problem. And so, we do not know what the long-run deficit is going to be.